Fights into Marseille must arrive by 3 pm. DISCOVERY Join a Guided Tour for an evening drive of Lyon, lined with incredible landscapes, from Fourvière Hill for a city bird’s eye view, to Presqu’île district, for catching the heart of Lyon and its ever-changing river bank view. 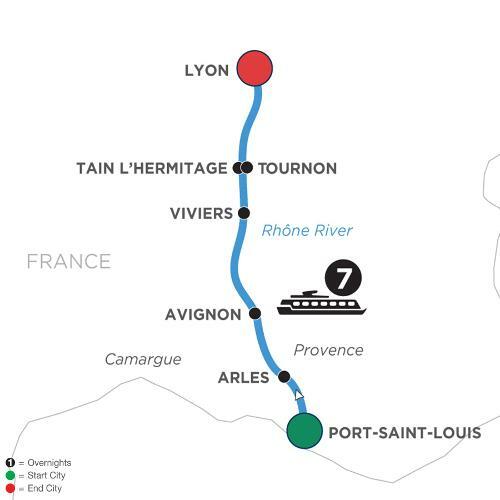 Your Active & Discovery river cruise is full of Avalon Choice inclusions for each port you visit along the Rhône River. Choose the Active, Classic, and Discovery included excursions that speak to you—from casual and leisurely to cultural and active. In addition to classic sightseeing and relaxed free time, you can visit an oyster farm, bike through Camargue Regional Nature Park to spot flamingos, or take a painting workshop in Arles—in the style of Van Gogh. You’ll have the classic sightseeing and relaxing activities in each destination, along with your choice of included arts, culture, and cuisine excursions, for the French vacation you’ve dreamed of. Take a canoe excursion or linger in a corner cafés; stroll Avignon’s papal palace or attend a wine tasting in an under-ground cave. Admire the lovely views of the French countryside, or join a culinary walk to discover architecture and local specialties, or take a cooking class in Lyon. With so many included choices, you’ll find the perfect way to spend your day—from a ghost tour in Viviers to a guided bike ride through the birthplace of rosé wines, to a chocolate factory tour. Our Active & Discovery Rhône River cruise with Avalon Choice includes activities and excursions to experience the Rhône River your way and at your pace.